An exceptionally pretty silver plated (EPNS) English powered sugar sifter spoon with a pretty cut out design in the bowl. This sugar sifter spoon is also exceptionally pretty and unusual because it is moulded into the shape of a flower. It has a curved handle too, which combined with the deep pierced bowl, means this spoon could also be used as an effective tea strainer. In fact, it may well have been intended as a quirky tea strainer, but works well for straining tea or sifting sugar. 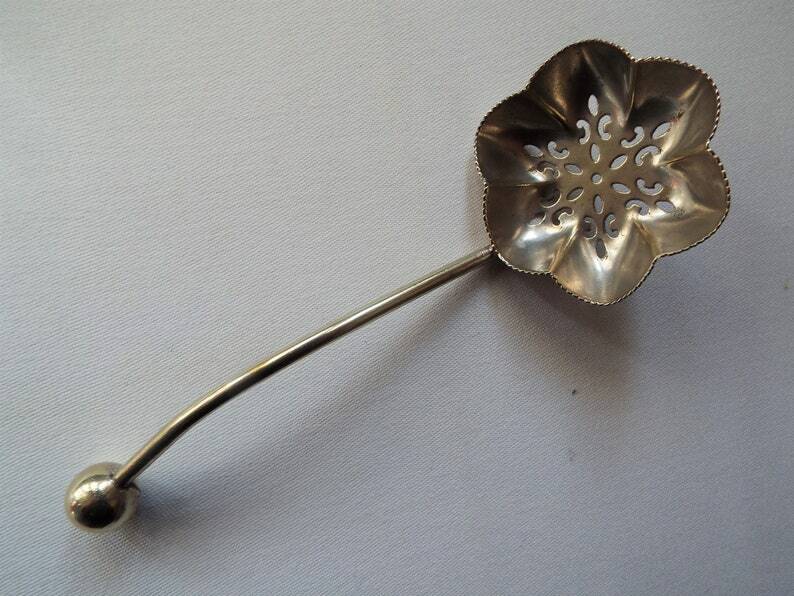 It is one of the prettiest and most unusual pretty sugar sifter spoons that I have found in a long time. There is no maker's mark, but its appearance and slight wear on the spoon bowl's underside, shows that it is silver plated ('EPNS' - electro plated nickel silver) The long and curved handle is perfect for its originally intending purpose of sprinkling powdered (icing) sugar over pretty tea party cakes, or berries such as strawberries. This spoon would also display beautifully in a cabinet or sideboard filled with pretty vintage china tea sets and other pretty vintage things. A perfect gift for an afternoon tea fan or someone who loves to bake, it would also make a lovely small thank you gift to someone special. It is an particularly beautiful example of an vintage sugar sifter spoon in especially good condition. 13.3cm (5 1/4 inches) in total length from spoon bowl rim to handle tip (approximate). In good vintage condition. Just some areas of minor wear to the silver plate in the spoon 'bowl', upright side and underside, but this is commensurate with age and use. The upright inside of the spoon 'bowl' has a matt silver finish. Overall, this is still a shiny and bright pretty thing, which is perfectly sound and usable. Any further wear there may be is commensurate with age. Please just ask for further photos. Your spoon will arrive carefully packaged and beautifully wrapped for FREE in vintage style brown paper and ribbon.